There are several possible reasons for your Dirt Devil Dynamite vacuum's failure to pick up dirt and dust. The first thing you have to do is identify whether the problem is due to a reduction in the cleaner's suction levels, or difficulties with the brush roll, which loosens dirt in carpets, allowing the suction to carry it into the vacuum's dirt receptacle. If your Dirt Devil Dynamite doesn't pick up crumbs like these, it's time to find out why. Even if your Dirt Devil Dynamite's dust receptacle is empty, your cleaner's suction will be greatly reduced if it is not installed correctly. To ensure it is firmly in position, remove it and reattach it. The dust receptacle is released from the vacuum by pressing the button on top of its lid. The lid is removed by grasping its handle and turning it counterclockwise. To remove the filter, twist it counterclockwise and lift it out of the dirt container. Empty anything in the dirt container into the trash can, place the filter back in position and secure it by turning it clockwise. Place the dirt receptacle lid back in position, and line up the arrow on the lid with the unlock arrow on the dust receptacle. Turn the lid clockwise until it is locked in position. 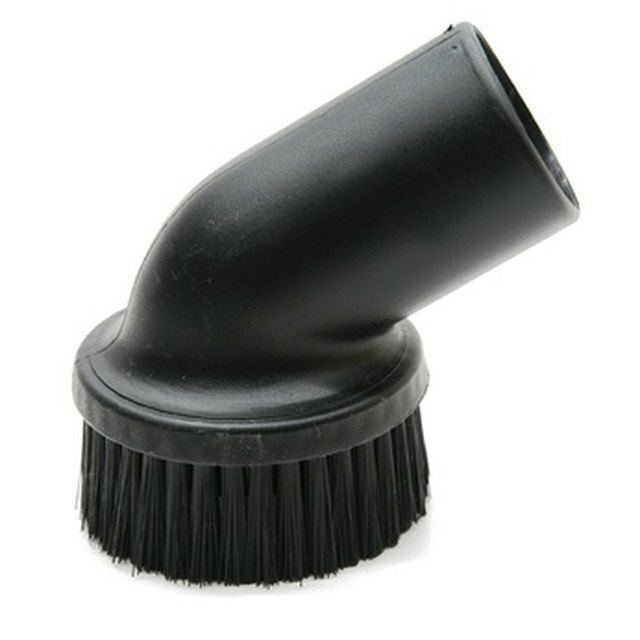 Return the dust receptacle to the vacuum, ensuring it is securely in position. A clogged filter is another possible reason why your Dirt Devil Dynamite is not picking up dirt. When you remove the filter from the dust receptacle, as outlined above, tap it firmly against the side of your trash can. Repeat the procedure until dirt and dust stop falling out of it. However, do not brush the filter. Your Dirt Devil Dynamite will also stop picking up dirt if the hose that links the floor cleaning head to the dust receptacle is clogged. To check for clogging, remove the screw holding the hose in position on the inlet to the dust receptacle. Pull the hose free, and check carefully for any obstruction. Remove any blockage you find, push the hose back into position and replace the screw. Any obstruction of the floor cleaning head will also prevent your Dirt Devil Dynamite from lifting dirt and dust off your floors. Turn the cleaner over, and lay it flat on the floor so the cleaning head inlet is exposed. Remove any obvious blockages. If necessary, remove the nozzle guard by unscrewing the six screws holding it in position. A broken belt, a worn brush roll or a combination of the two problems, will prevent your Dirt Devil Dynamite from removing dust and dirt from flooring. To replace them, remove the floor nozzle guard as described above. Then lift out the brush roll and remove the old belt. Slide one end of the belt on to the motor shaft, and place the other around the end of the brush roll that has no bristles. Place the brush roll back in position, and rotate it to ensure it is secured within the belt. Replace the nozzle guard, and secure it by replacing its six screws. When trying to diagnose any problem with your Dirt Devil Dynamite, always switch the vacuum off, and disconnect its plug from the electricity supply. Do not reconnect it until all parts are firmly back in position.